My Son came with His apostles to the mount of Olives. There was a garden there that He frequently went to pray: He felt a sadness; a deep, deep sadness. He felt lonely: my Son in His humanity felt a deeper sadness than anyone could ever feel because He was pure of heart: He was sinless. He took His closest friends, Peter whom He was to give charge of the Church, James, and John. John was the one who was going to take care of me after Jesus had risen from the dead. Jesus said to them: My heart is sorrowful to the point of death: stay here and pray and keep watch while I go and pray by Myself.” Jesus went over further to pray: He wanted to pray by Himself. He wanted to pour out His heart to His Father as I often have seen Him do with His prayer. My Son always prayed continuously to His Father: He always looked to the Father for His consolation. During the time He prayed, He saw all the agony He was going to suffer: and the agony was not so much the pain of the crucifixion as the pains of the sins of the world. Every sin, every injustice, every infidelity He saw and felt at that very moment, caused Him to sweat blood. His agony, His sorrow, and so much sinfulness caused the blood to burst from His forehead. It was just another anticipation of when His Precious Blood would be shed on the cross. That Blood that was sweat on Gethsemane blessed that very spot into Jesus’ sacred place of prayer. My Son was sent to Pilate after being judged by the Jewish authorities, I was there in spirit: I heard Pontius Pilate as he came out to talk to the crowd. 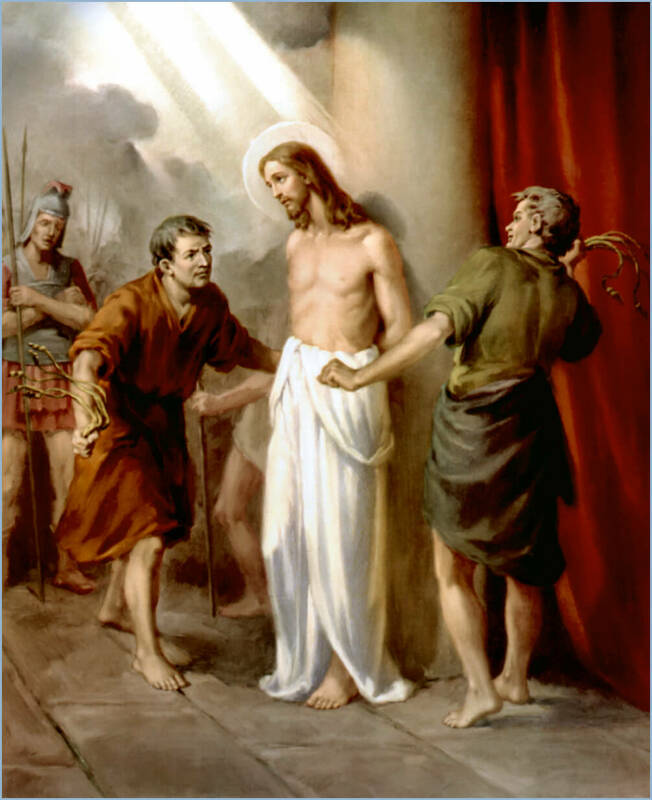 He said: “I find no fault in this Man worthy of death: so I will have Him scourged: then I will set Him free.” Pilate said this to placate the crowd because he knew my Son was innocent of all the accusations that they were throwing at Him. Pilate sent my Son to be scourged: He was whipped. The normal procedure was to be whipped thirty-nine times. My Son was whipped furiously: the demons took possession of the soldiers. All the anger of hell was vented out on my Son. At that moment, I asked the Father to spare my Son from dying at the scourging and the Father answered my prayer: and still the soldiers that scourged my Son were filled with the very hatred of hell itself. That was the reaction they had to the purity of my Son. When Jesus received all this scourging for the love of you, it was because He loved you that He took all this pain: because He wanted you to be healed of your sins: of all the diseases of the soul, mind, and body that Jesus took all this punishment. Jesus did not take all this punishment to condemn you: He took it all to save you. Behold the love of my Son for you and yet behold His meekness as the Lamb that is brought to the slaughter: my Son was scourged without even opening His mouth. After the scourging, my Son was led to the praetorium where the soldiers wanted to further amuse themselves. They took some twine filled with thorns and made a skull like cap. They placed the cap on the head of Jesus and pressed causing the thorns to penetrate His scalp until He began to bleed. Then they put a reed in His hand and they knelt before Him and they mocked Him and said to Him, “All Hail, King of the Jews,” and they spit in His face, they hit His head with the reed, they slapped His face, and plucked His beard. Jesus continued to say nothing. He received it all. When we had finally reached Mount Calvary, my Son was thrown on the cross after being stripped naked in front of the crowd. They drove spikes through His hands and feet and yet the Lord gave me the strength to withstand the sight of my Son being nailed on the cross and literally butchered by the soldiers. They lifted the cross to its place, and then my Son hung there for three hours. I heard my Son say, “Father, forgive them, for they do not know what they’re doing.” Jesus prayed for His enemies and pleaded for their ignorance: He also pleaded for your ignorance. There were two thieves crucified with Jesus, one on His right and the other on His left, and to the repentant thief He promised paradise. Finally He looked at me and at John: He told me, “Woman, behold your Son” and to John, “Behold your mother.” My spiritual motherhood is Jesus’ gift to you: Jesus gave me to His disciples and to the whole Church to be mother and intercessor for everyone who calls himself a Christian. When the third hour came, the sky became dark and Jesus cried out, “Father, into Your hands I commend My Spirit.” My Son bowed His head, the symbol of obedience to the Father, and then the earth began to quake. There was a great storm in Heaven, the whole of creation was reacting at man’s crime, the killing of their God, the killing of their Savior. After it was calm, Nicodemus, Joseph of Arimethea, and John took my Son down and then placed Him in my arms. I remembered while I was holding Him the prophecy of Simeon, “The sword of sorrow will pierce your soul.” That prophecy was coming true: but just as I was holding my Son in my arms, I remembered His words that He would rise, again. All that I needed to do was to wait until that prophecy was fulfilled. My children, ask the Father to extend His salvation and forgiveness to your enemies. Pray for those who abuse you: pray for those who hurt you in any form. Ask the Father that they will also be cleansed by the blood of Jesus shed on the cross. Come, my children, to the foot of the cross and there I will pray with you and for you that your sins will be blotted out: that you will experience the redeeming power of my Son. Pray before the crucifix and I will pray with you. Ask the Father that you will constantly remember the death of my Son and be ever grateful for the salvation He has obtained for you.